Practical or extravagant, perfectly fitting or perfectly outstanding, 3D printing has been pushing the limits of personalized footwear over the last several years. Creating a one-of-a-kind, wearable product has become easier than ever, and 3D printed shoes are already being used on racetracks and runways around the globe. In need of a better-fitting shoe size? 3D printing can do the trick. 3D modeler Frederik Bussels from Belgian design studio Pixel Depot took pictures of a foot and turned these photos into a 3D model using Autodesk’s 123D Catch application (click here to learn how to turn photos into 3D models yourself). 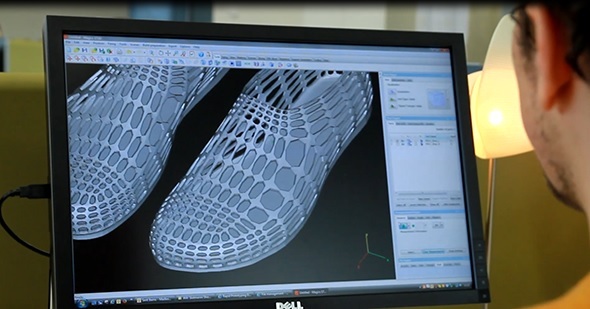 He then shaped a 3D shoe model to wrap perfectly around the foot. Once the 3D shoe model was complete, the only thing left to do was print it. Frederik chose a rubber-like material, which is produced by a powder-based 3D printing technology. 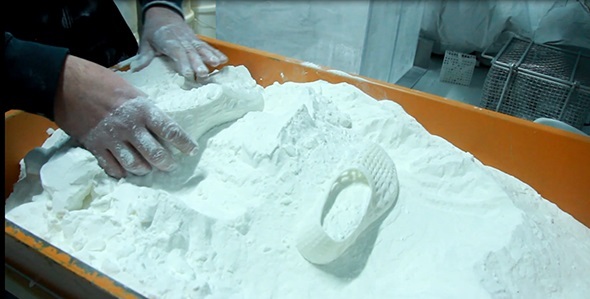 i.materialise then printed the perfectly fitting shoes that will make each step as comfortable as possible. 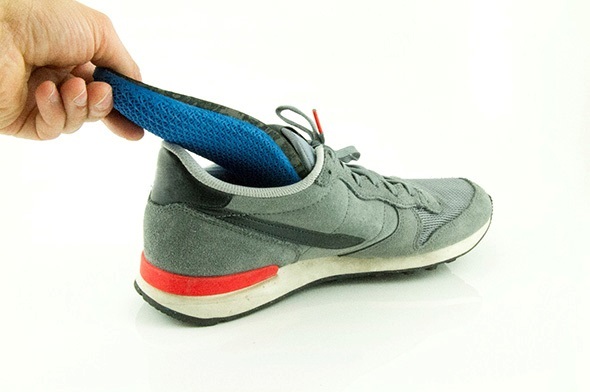 In addition to printing an actual shoe, having perfectly fitting insoles might even be more important for people who depend on the perfect fit: athletes. RSPrint does exactly this: they created the world’s first dynamic 3D printed insoles, customized to truly support every move of an individual. To achieve this, first, a high-detail dynamic scan of the foot is taken. 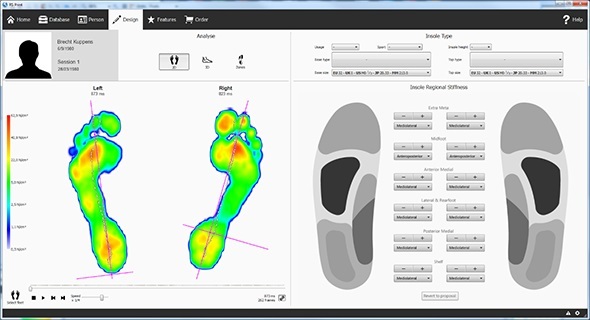 A trained specialist then analyzes the footprint to see the exact locations and directions in which the foot needs extra support. Based on the specialist’s analysis, a model is generated, which is then 3D printed. I use the [3D printed] insoles in training to prevent over-stressing my body during workouts. Since my injury, I am now more cautious than ever to make sure my feet are well taken care of so that I can reach my new running goals of the London Marathon. Without the support of RS Scan and the insoles, I would not have been able to recover back to this point post-operation and also probably not be able to continue my career as long as I did on my foot! 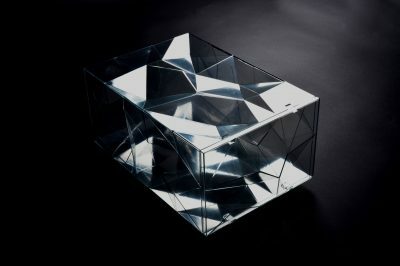 3D printing also allows for extravagant designs and experimental forms. It provides shoe designers with new freedom and new possibilities. 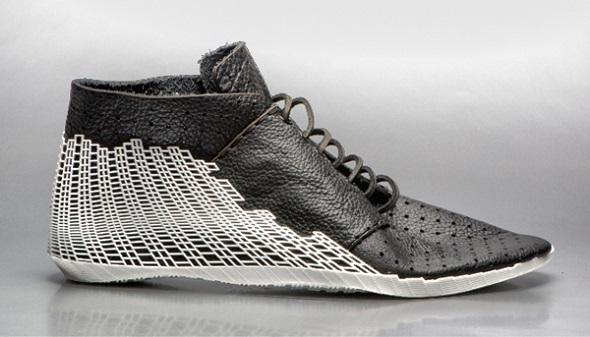 Earl Stewart’s “098 XYZ Shoe” is a good example of hybridization between 3D printing technology and traditional shoe making: the bottom part is printed, while the top part is made out of leather and added manually. It illustrates how the most advanced processes of fabrication can be integrated with (and contribute to the revival of) well-established crafts. 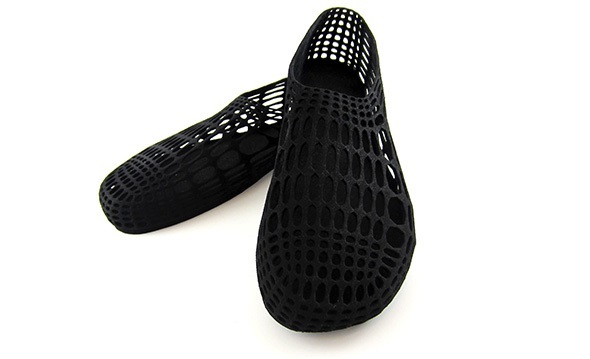 Shoe designer Katrien Herdewyn, who has a background in electrical engineering, material sciences, and nanotechnology, decided to blur the line between these fields and started experimenting with 3D printing in her shoe designs as well. She teamed up with Frederik Bussels to create a stunning pair of high heels that were printed by i.materialise. With my background in engineering, I try and combine new technologies with traditional craftsmanship. I believe this is where the future lies. 3D printing offers so many possibilities; you can do anything you can imagine. But when it comes to shoes, a designer always has to take into account that you have to be able to wear and walk in the shoe. I want to design shoes that are high tech and high fashion at the same time. Are you also interested in printing your own designs? If you don’t know how to create 3D printable models yet, you can get in touch with our freelance 3D modelers. If you have a 3D file that is ready to go to the printer, upload it here, choose your favorite material, and get an instant price quote.